Michelle Hunter teaches all subjects to fourth graders at Shadeville Elementary School in Crawfordville, Florida. The school has been certified as a Florida PLT School since 2000, and Michelle has been the school’s PLT Coordinator for the past three years. For the school to maintain its designation as a PLT School, at least 80% of the faculty members are required to attend a PLT workshop, and of these 80%, at least 50% are required to participate in an annual PLT week. Michelle organizes this school-wide, week-long environmental education unit that incorporates multiple, grade-level-appropriate PLT activities for each student, a science and literary fair, and community guest speaker presentations around a particular theme. Over 650 youth, 50 faculty members, and hundreds of parent volunteers participate. This year, the week-long event “Wakulla Water Wonders” held in April combined PLT activities and guest speakers from St. Marks Wildlife Refuge and Wakulla Springs State Park. A trained PLT facilitator, Michelle leads in-service PLT professional development workshops to help her fellow colleagues incorporate the PLT curriculum methods and techniques into their own classrooms throughout the year. To further help teachers provide experiential experiences that enhance student learning, Michelle works with a local nursery to maintain the school’s butterfly garden and outdoor classroom. Here, students learn about native plants, bird identification, and animal habitats through hands-on, outdoor investigations. 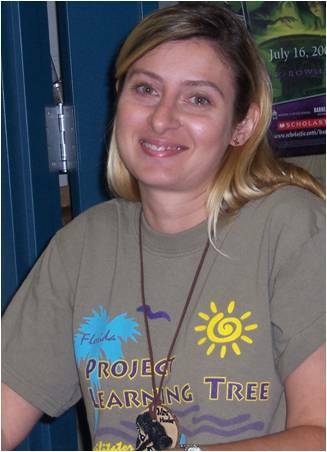 Michelle also organizes school environmental field trips for several classes and encourages other teachers to take part. This year, students visited Marianna Caverns, Gulf World, Bear Creek, and Gulf Specimen Marine Lab. Michelle’s own annual class trip to St. Marks Wildlife Refuge gives students the opportunity not only to experience Florida’s wiregrass ecosystem, but also to help restore it by planting wiregrass plugs. Michelle was named National PLT Outstanding Educator in 2007. Debra Wagner uses PLT activities in her fourth grade at St. Paul Lutheran School in Lakeland, Florida, and helped her school become PLT-certified.